To use Object Storage you must register first as a customer for Interoute Virtual Data Centre (VDC). However there is no commitment to use VDC services in order to access Object Storage. Your use of Object Storage or VDC will be entirely billed on a pay-as-you-go basis. You will need to start by logging in to the Object Storage web interface to obtain your API access keys. With your VDC login details, you can access the My Services portal to connect to Object Storage. See this video for guidance: https://cloudstore.interoute.com/resource-centre/videos/overview-vdc-myservices-cloudstore . The user interface for Object Storage is accessed via the Interoute 'My Services' web portal. The 'API keys' at the bottom of the welcome screen—API Key and Secret Key—are what you will need to access Object Storage via the API. You can find these keys at any time later from the Api Access button on the main screen of Object Storage. For information about working with the graphical user interface, see the Object Storage User Guide. The JSON file interoute-object-storage-refdata.json contains all of the reference information about regions, API endpoints and storage policies in a structured format for programming use. 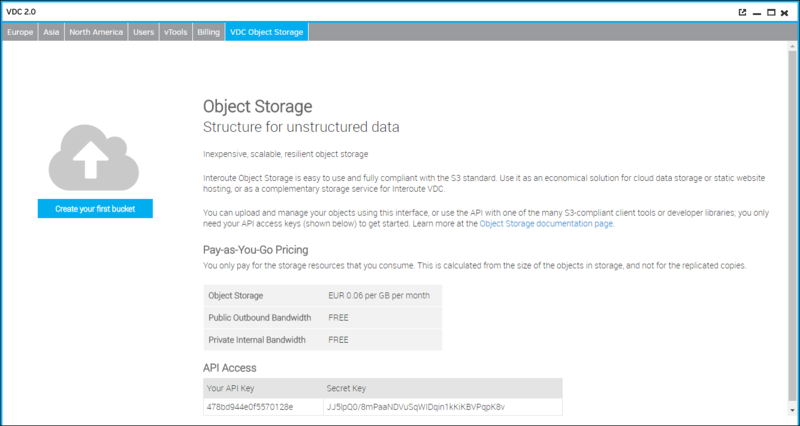 The Object Storage API is compatible with the Amazon S3 standard. This means that you can connect to Object Storage using any client program or programming library that is based on that standard. S3 compatibility means that, in most cases, you can switch your client tool between Interoute Object Storage and any other compatible object storage service by simply changing the API access keys and API host endpoint address. Most client tools require a particular form of configuration file containing the API keys and information about the host server. For example files, see https://github.com/Interoute/object-storage-api. An example based on using the 's3cmd' tool is given in the 'Getting Started' section. For uploading using the API, including using a client tool, the maximum allowed PUT size (that is, for one API call) is 10 GB. Using a multipart upload, the platform allows a maximum of 10,000 part-uploads. Note that client tools may impose a 'single PUT' limit that is smaller than 10 GB. Multipart uploads are recommended for objects greater than 100 MB in size. Note that the upload limits are different when using the user interface: multipart uploads are applied automatically (based on a fixed 10 MB part-upload size) and the user interface can upload objects with a maximum size of 96 GB. In Object Storage, files are stored as 'objects'. Every object must be contained in a 'bucket'. And buckets can be sub-divided through the use of 'folders'. Buckets created using the API will not be correctly visible in the Object Storage user interface, until you do a 'put bucket CORS' API call for the bucket. See below for an example of doing this. The following is a short tutorial to setting up the 's3cmd' client tool, and performing some basic API operations. You can also use Python 'virtualenv' and the pip installer if you prefer to use Python applications that way. You need to insert values for the API keys in place of $INTEROUTE_S3_KEY and $INTEROUTE_S3_SECRET. The default location for configuration information is the file '.s3cfg' in your home directory; otherwise you can specify a configuration file using the '-c' option on the command line. Bucket names have to be unique so it's likely another user has used this name already and you will get an error message 'BucketAlreadyExists'. If so, try a different name. Buckets created with s3cmd will use the default storage policy for the object storage region, see “Working with storage policies” below for information about how to set storage policies for buckets. Buckets created using the API are not correctly visible in the Object Storage user interface, because the interface requires a CORS (Cross-Origin Resource Sharing) configuration for the bucket. It is easy to add this to a bucket with one command. The file CORS.cfg needs to be in the current directory (or use a filepath string). The Object Storage service is offered in several regions, each of which contains two or more data centres, as per the following table. For creating and managing buckets and objects, you should use the API endpoint for the region where the specific bucket is (to be) located. There are a few exceptions to this, where you can use any API endpoint to see information about buckets which are not in the corresponding region. For example, if you do an 'ls' listing of buckets (as in 's3cmd ls'), you will see all of the buckets from all of the regions. The default region is 'EU' and buckets will be created in that region, if no region is specified. Note that if you try to specify the default region, this does not work! ERROR: S3 error: 400 (InvalidLocationConstraint): The specified location constraint is not valid. This is one of the peculiarities of the S3 API standard that you need to be aware of. The storage policy applies to every object in a bucket and is fixed at the point of creation of the bucket. The policy determines how an object is replicated in the data centres of an Object Storage region. The table below shows the currently available storage policies. s3cmd cannot be used to set or check storage policies for a bucket. This section shows using Python for making calls to the Object Storage API. Next, you need to download a helper program, awsauth.py, to generate the required authentication information for the API call. Download it from this link: https://raw.githubusercontent.com/Interoute/object-storage-api/master/awsauth.py. Store this file in the folder where you will be running Python. You will get an error if you use a bucket name that is already taken by another user; in that case, modify the bucket name. The storage policy for a bucket is not currently visible in the graphical user interface, and S3-compatible client tools may not show it either, because it is not part of the S3 API as defined by AWS. However it is simple to obtain the information using a direct API call. You only need to look up the 'policyid' in the table below to identify the storage policy that is being used. Note also the response header 'x-amz-bucket-region' which contains the bucket's region. You need to set a CORS configuration for a new bucket. Here is how it can be done using an API call. It looks a little complicated as the call needs to include an MD5 checksum. Since the 'CORS.cfg' file is always the same, you can pre-load it and have the encoded MD5 checksum ready to use. See the file api-start.py for an example of that. The following table shows the available storage policies and the policy ID to use when creating a bucket with the API. The default policy for a region is the storage policy that will be used if none is specified in the API call. Note: the contents of this table are available in the JSON file interoute-object-storage-refdata.json in a structured format for programming use. For API requests in a non-default region, always use the specific API endpoint for that region. Note: the region/location response is 'empty' for the default region! The default behaviour of Object Storage is to replace an object if another object is uploaded with the same location and name. However if you enable versioning for a bucket then objects are not replaced but are stored in multiple versions, each one being tagged by a unique 'version id'. Versioning of objects is not currently supported through the Object Storage user interface. In the user interface, you can only see and access the most recent version of an object. In the following examples, a new bucket 'testversioning' has already been created in the EU region. Replace 'testversioning' with the bucket name that you are using. Versioning is controlled at the bucket level. It can be enabled or suspended at any time. In this example, the object 'testobject' is being stored in three versions. Objects (and folders) can have user-defined metadata attached to them, in the form of key-value pairs. Object metadata is returned from an API call in the HTTP headers. The metadata headers start with the string 'x-amz-meta-'. For example, for an object 'picture.gif' a key-value pair has already been attached to it. This has key equals 'content-type' and value equals 'image/gif'. To change the value for an existing key, do 'add-header' again with the new value. Note that you don't include the value in the remove command.